Lakefront Home w/ Dock & Hot Tub Near Schweitzer! 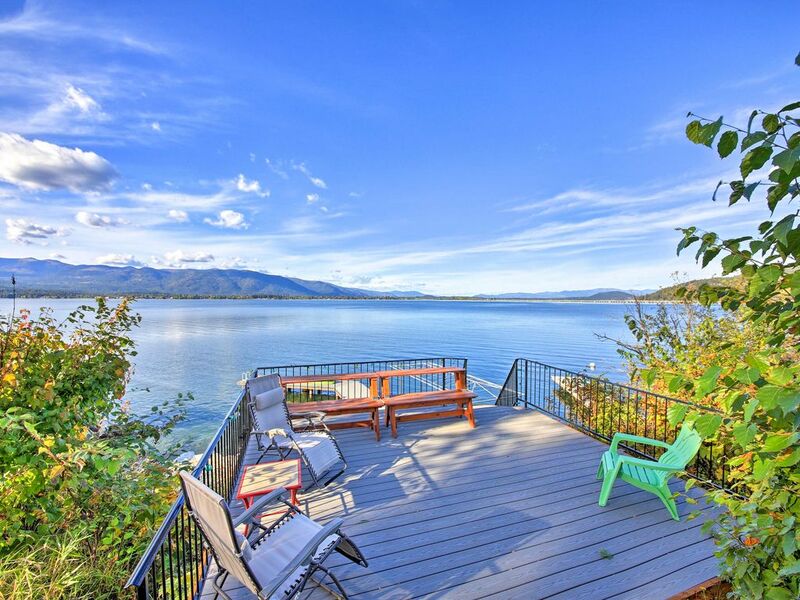 Escape to the serenity of Pend Oreille Lake at this 4-bedroom, 2.5-bath vacation rental home! Located in Sagle, this getaway offers accommodations for 11 and a private dock! Whether you're spending the day on the lake, soaking in the hot tub or shredding the slopes at Schweitzer Mountain Resort just 30 minutes away, this immaculate abode is the perfect home base! Venture to the gorgeous shorelines of Sagle to discover this charming geometric home highlighted by a bright yellow front and garage door. You're sure to adore the gorgeous 2,400-square-foot interior, as it boasts vaulted ceilings and plentiful windows revealing the stunning Pend Oreille Lake. With plush leather furnishings, exposed wood beams, and a gas fireplace, the living room exudes rustic elegance. Kick back and relax as you flip through shows on the flat-screen Smart TV and take advantage of the high-speed wireless internet! For a breath of fresh air, pop out to the expansive deck overlooking the lake and surrounding mountains. When you're ready to get out on the water, grab the paddle boards or paddle boat provided by the home - there's even a private 700-square-foot dock you can tie your boat up to! If you're seeking pure relaxation, hop right in the private hot tub to soak your cares away. After working up an appetite, retreat to the fully equipped kitchen to whip up a wholesome meal for you and your travel companions. With modern appliances, all your culinary essentials, and generous counter space, cooking will be a breeze! Each bedroom is tastefully appointed with cloud-like beds, cozy comforters, and the privacy you’ll need to get a good night’s sleep. The master bedroom also hosts an en-suite bathroom, where you can sink into the large deep soaking tub or take a relaxing rinse using dual shower heads! The home also features 2.5 bathrooms throughout, making it easy to get ready each morning! With so many great amenities at the home, you'll have a hard time leaving the property! For a little exercise, ride the 2 cruiser bikes or walk along the local streets and stop by Forty-One South or Shoga Sushi for a bite to eat! This home is also withing walking distance to The Lodge at Sandpoint - perfect for a wedding reception. In the colder months, mountain adventures await at Schweitzer Mountain Resort, home to snowy peaks where you can ski, snowshoe, tube, and snowmobile! If you're lucky, you might catch one of the several events the resort hosts, such as the Buddy Werner U14 Championships or Schpring Finale! Just across the bridge is the quaint town of Sandpoint offering numerous watersport rental shops, local businesses, and tasty eateries like Spuds Waterfront Grill and Baxters On Cedar! Offering fun for the whole family is Sandpoint City Beach Park, featuring sand volleyball and tennis courts, as well as a lakefront beach! If you’re in the mood for a walk, stroll along the Sandway Byway Trail or Pend Oreille Bay Trail that are easily accessible! - Amenities include a fully equipped kitchen, a private hot tub, 2 flat-screen Smart TVs, free WiFi, a gas fireplace, central heating, ceiling fans, linens, towels, pack-n-play, in-unit laundry machines, hair dryer, a deck, patio furniture, 2 cruiser bikes, a tandem bike, a peddle boat, a newly remodeled private 700-square-foot dock, paddle boat, 2 stand up paddle boards, driveway parking for 2 vehicles, and more! - Unbeatable Lakefront location - Steps from the water, The Lodge at Sandpoint, and minutes from Schweitzer Mountain Resort and the town of Sandpoint! - No pets allowed. Violating this policy will result in a minimum $500 charge. This home was a great fit for our family. It is located right on the lake with incredible views. The home is well stocked with a big open family area, comfortable beds, and a hot tub. Check in was easy and the property manager was very responsive. We came for a long ski weekend, but hope to return someday during the summer. Great house with an amazing view. We loved the house and it was everything we expected. Would love to spend some time there in the summer. Thanks. Very comfortable home. Spectacular view of the lake and mountains from the living room. House easily accommodated our family, even the toddler twins. Thank you for sharing your home. This home has the best views of the lake and mountains. Perfect setting for family Christmas card pictures. The house was great. Beautiful view. Great location. Well equipped. Would definitely stay again. My extended family stayed here for a wedding. Beautiful view of the bridge. Very clean and a great layout with all of the bedrooms upstairs. Would stay here again! Thank you for the kind feedback! We are glad you enjoyed your stay and we hope to host you again for your next trip!